This spring spray will bring melodies of warm spring days in Alberta to your celebration of life or memorial service. Most products will come locally from BC. * Would you like to upgrade your bouquet? Choose One (required)Large Upgrade: +$15.00Supreme Upgrade: +$30.00No thank you, no upgrade needed today! + ( $NaN ) Would you like to upgrade your bouquet? Delivery within Edmonton, Sherwood Park and St.Albert city limits is $14.95 plus GST. The cost for delivery is not included in the cost of the bouquet. Deliveries to areas outside the city will be determined on a case-by-case basis. Best Buds will contact any customers requesting deliveries outside city limits to confirm pricing. Delivery times are subject to change. Please note that we will endeavour to make all bouquets as close to the photo provided. However some flowers, or colours are seasonal and may not be available. When I walked into Best Buds, I was greeted with homemade cookies and warm smiles. Best Buds went above and beyond to deliver absolutely stunning arrangements. The flowers lasted for more than a week after my event. I HIGHLY recommend Best Buds for everyday flowers or your next big event!! Very personable and the prices were reasonable. Delivery was quicker than anticipated, which is always good :). It was the first time I have used Best Buds and it definitely won't be the last !! Highly recommend using them. The ladies at Best Buds are awesome! I have used them numerous times from my wedding, birthday bouquets, funeral arrangements, Valentines flower, you name it. Every single time they have delivered on time and with great prices. 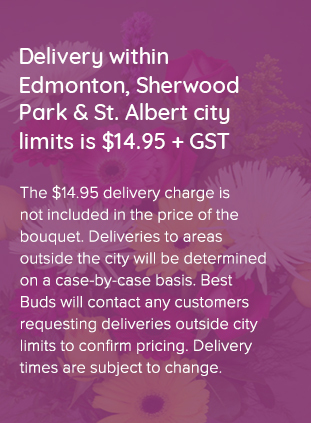 Great local flower shop in Edmonton with a very convenient online ordering system. Really helpful and friendly staff and the quality and design of the flowers are 5 stars. Kim and her staff work tirelessly to ensure their product and service deliver a great customer experience. You can trust them for all occasions, large or small, you will never be disappointed. They have worked wonders on several occasions, often with very little notice. Great cookies too. "Success is touching a heart with every one of our creations." Best Buds Flower Company is one of Edmonton's top florists. 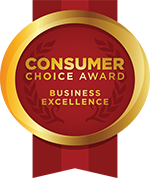 We are a locally owned and operated company. Our customers can order flowers online and expect delivery of fresh flower arrangements and bouquets in Edmonton and surrounding areas for all occasions including weddings, anniversaries, birthdays and sympathy.